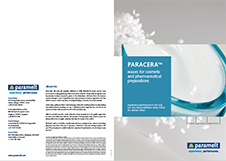 Paraffin (and) Glyceryl palmitate/stearate (and) Cera alba (and) Stearic acid. Beeswax Blend 164 by Paramelt is a blend of beeswax with other ingredients. It is a partially synthetic beeswax. Its chemical, physical and performance characteristics are comparable with pure beeswax. Beeswax Blend 164 applications include creams and ointments, decorative cosmetics and stick form products. It has a shelf life of at least two years.